The Maud Marks Library is excited to announce that this summer, the library will be hiring 2 summer interns for 9 weeks. The library is looking for motivated, high energy high school students ages 16-18 to help us out during our summer reading program. The applications are available until May 15. You may also come into the library for a copy. These applications must be returned in person before the May 15 deadline. It would be a good idea to include a resume with the application. Should you get the job, you would be required to work Monday- Friday, 1 PM- 5 PM from June 3 to August 2. Among your duties would be shelving and helping with our summer reading program events. The Maud Marks Library is excited to provide this opportunity for teens in the Katy community. 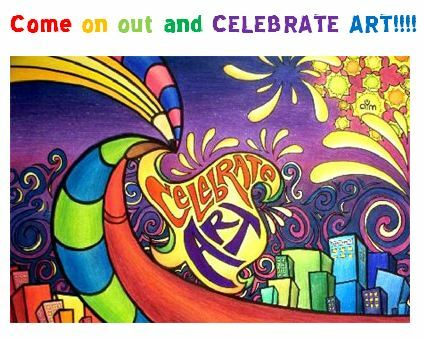 The community is invited to join us at the Maud Marks Library this Saturday from 4-6 for the opening reception for our annual "Celebrate Local Artists" art exhibition. Thirty artists from the Katy area are exhibiting (and selling) their artwork throughout the month of April at the Maud Marks Library. Come and see the incredible talent we have right here in the Katy area. Then if you join us on Saturday, April 6 for our opening reception, you can meet and mingle with many of the artists we have displayed. Do you dabble in the fine arts? Do you have an inner painter or sculptor waiting to come out? The Maud Marks Library want to show off your work during our annual "Celebrate Local Artists" Art Exhibition. This call is open for all professional and emerging artists ages 6 years & above. All you have to do is fill out and turn in our Entry Form & Artists Agreement Form. Please return the form to our curators at merehartists@gmail.com by March 25, 2019. Should your art work be accepted in to our exhibit, we will let you know by March 27. Seniors 55+ are invited to join the Maud Marks Library’s Timeless Travelers program this Saturday, March 2 for a FREE trip to the Washington on the Brazos for their Independence Day Celebration, courtesy of the Friends of Maud Marks Library and Precinct Three Transportation. The bus departs at 9 AM from the Maud Marks Library for a fun day in Washington-On the Brazos as we listen to music, meet with reenactors, and more!. Seating is extremely limited. Please call the Maud Marks Library at 832-927-7860 to register for this trip. Timeless Travelers is a program series promoting educational and cultural enrichment for senior adults. Once a month we take free bus trips across southeast Texas to experience the culture and history of this great state. The only requirement is that you are old enough to attend (55+). Thanks to the Friends of the Maud Marks Library for sponsoring this series. Find Your Next Read at the Library! Join us this Saturday, February 23 from 10 AM- 4 PM for our next Friends of the Maud Marks Library Book Sale. In addition to our regular books, we also have a nice selection of DVDs, CDs and vinyl LPs, including some old 78's for sale. Come see our insane prices and find your next favorite book!